Pugs' small bodies make it a challenge for them to swim. Their weight and short legs work against them when they are in water. 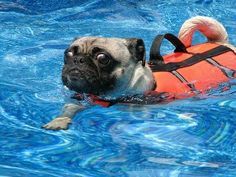 Not all Pugs like to swim, so they may avoid the water. They should be monitored when they do swim, though, because they tire easily and could drown.Although the Scottish Terrier likes water, their heavy body and short legs combine to make it a poor swimmer. It also has a heavy coat that can become waterlogged. This breed should never be left by water unsupervised, because they will sink when trying to swim. The Shih Tzu has a short snout and a short neck. 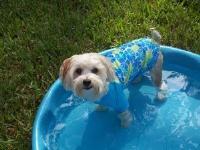 Because of this, the Shih Tzu struggles to keep its head above water when trying to swim. It also has human-like hair that gets very heavy when wet. Never leave a Shih Tzu swimming unattended, because it can tire easily while in the water. 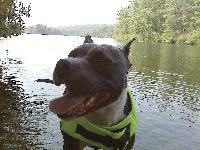 The Staffordshire Bull Terrier has a very heavy and muscular body.This breed's body is not ideal for swimming. Its head is disproportionate to its body, creating an uneven distribution of weight. This makes it hard to swim, since their heavier heads keeps the dogs naturally tipping forward in water. > Does my dog need a winter Dog Coat or Sweater?